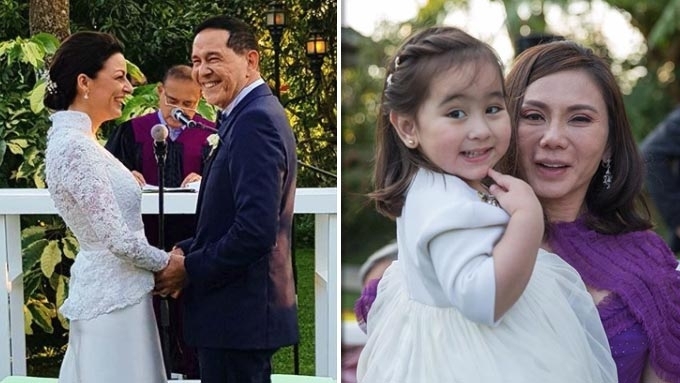 Scarlet Snow Belo attended the wedding of Atom Henares and his now-wife Natalie last February 2, with her parents Hayden Kho Jr. (not in photo) and Dra. Vicki Belo. Atom Henares's "modern family" welcomed its new member, his wife Nathalie. After 12 years of being together, Atom married Nathalie in a garden wedding last February 2, in Antonio’s, Tagaytay City. In attendance was Dra. Vicki Belo, the groom's ex-wife who is now married to Dr. Hayden Kho Jr.
Atom's "playmate" Scarlet Snow Belo, the daughter of Vicki and Hayden, was also present. Many netizens lauded Vicki and Atom’s show of support for each other. Atom and Vicki's daughter Cristalle Belo-Pitt with her husband, Justin Pitt. Quark Henares brought along his date, Bianca Yuzon (right). The groom's son was also the party's spinner. Scarlet Snow, who looked pretty in white, had heart-to-heart moments with the bride and groom. The toddler gave her “Papa Atom” a hug after the ceremony. The caption for this photo read: "Can't you have a baby tomorrow na?" At the wedding reception, Atom surprised his bride with a song number. He rendered his version of "Till There Was You" by The Beatles.